What can I say? The last 5 days have been one hell of a rollercoaster! Leaving Columbus seems like a lifetime ago already, we set off still on road to make the 61 miles to City of Rocks campground, 25 miles beyond Deming, we were still on soul destroying dead straight desert roads but at least there was a good stop to get food, and it felt like we were now heading the right way! We met a few other riders doing the same route, a group of 5 strangers who had met online and set off together, and it was great to share some tips and thoughts on what lies ahead. A few miles out of Deming I got my first mechanical, a sidewall gash that the tubeless tyre sealant wouldn’t plug, felt like a disaster at the time so early on, but with an inner tube in its been fine since. We paused at a reststop just short of City of Rocks and chatted to Joe, who had been maintaining the place for 16 years! Nice guy, told us stories of hunting rattlesnakes and gave us a couple of cans of ‘Dr Thunder’ (pepper) that cooled the heat off nicely. City of Rocks is hard to describe, but its basically a group of huge boulders maybe half a mile across, surrounded by barren desert, and used as a campground. 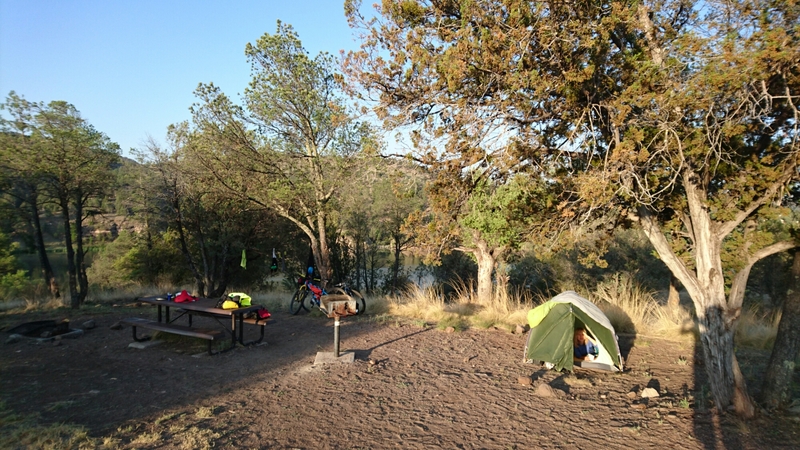 The showers, fire pits, and amazing views were very welcome, and it was a great first camp before we started roughing it properly. 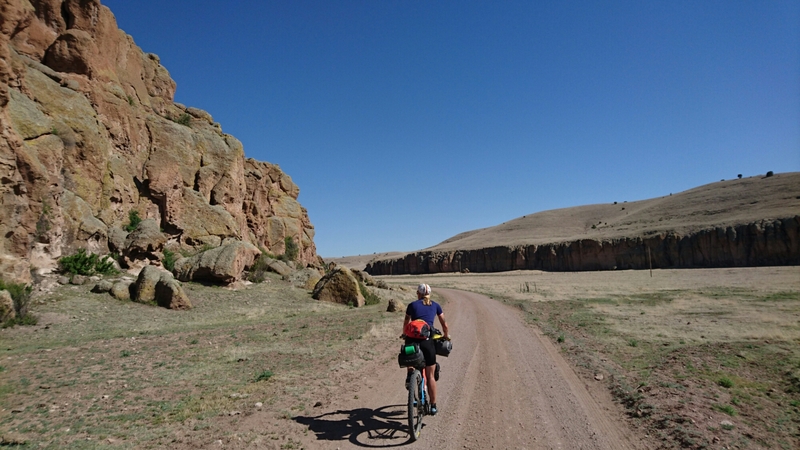 Day 3 – 65 miles, started much the same, on those roads that stretch to the horizon and beyond. We stopped off in Silver City a bit longer than we hoped, but after the tyre incident thought it sensible to pick up a spare. A couple of hours and a pizza later we were back on the road, and for the first time the gradient started ramping up significantly. It seemed in only minutes we went from desert into sweet smelling pine forest, and felt like a totally different world. We bumped into a couple of the riders from the day before and chatted bike setups and routes for a few minutes before pushing on up to Lake Roberts, another awesome campground, with a lake view and a couple of beers picked up from the store down the road making things very pleasant indeed. The locals generosity was again shown with some free burgers, nuts and fresh fruit from a family just out for the night. 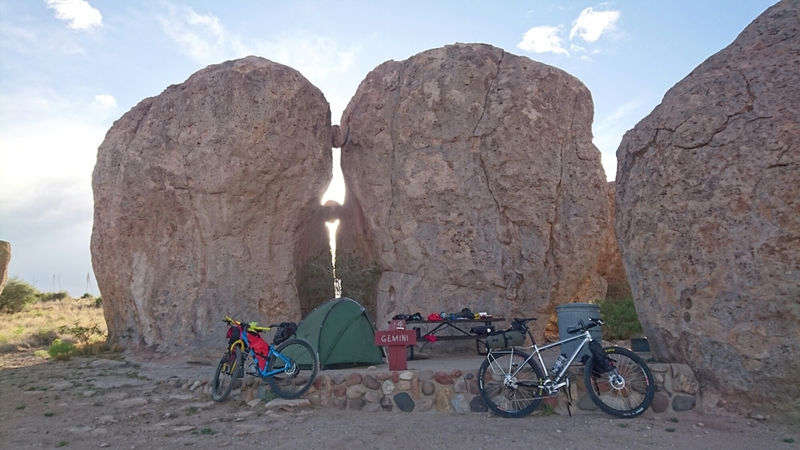 Day 4 – 55 miles, just when things were feeling easier, we hit out first proper off road section. Just out of Lake Roberts we turned off onto gravel and things went up hill again. 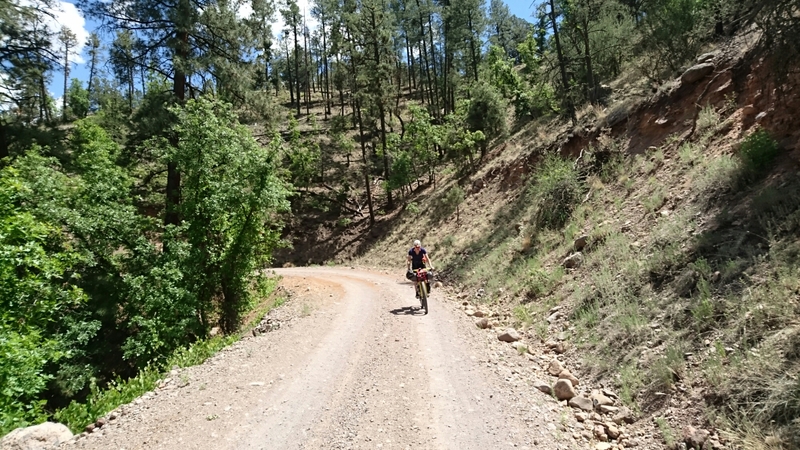 We found where America had been hiding the corners, as this was hairpin climbs and descents most of the way, and though the scenery was spectacular we were humbled by the punishing rocky trails. Running low on water by the end of the day and struggling to find a spot to stay, we crawled up to Beaverhead work centre. This was just a sort of station to deal with forest fires, but they had water and a patch of grass to pitch the tent. We fell into the tent hoping for easier things to come. Day 5 – 61 miles. Things flattened out but we were soon back into dead straight gravel roads through barren plains, broken up now and then by rock features that felt like a film set. It was dry again, and the heat returned, so by half way we were struggling big time. 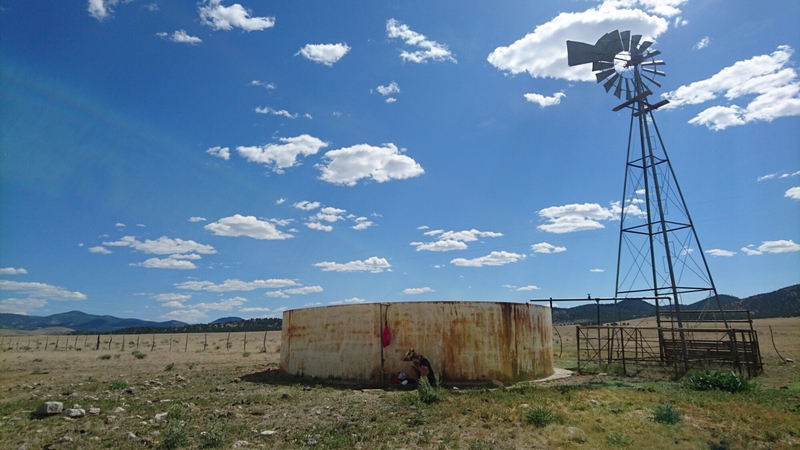 I’d read about windmills and getting water from cattle tanks along the route, but none so far had looked promising. Just when things were looking difficult to make it through the night, we stumbled upon a tank, full to the brim with reasonable looking cool water! This was out first chance to try the water filter, and with the tank being full we had a celebratory shower washing off 2 days of sweat and dirt. The refreshment didn’t last long and we struggled on for 20 miles into a ferocious headwind, before collapsing at the side of the road 10 miles short of our intended campground. Day 6 – 38 miles. Today the miles we had put in over the first week paid off, and although the morning was more hot, dry, straight gravel roads we had our sights set on Pie Town for lunch. Google the name if you want the history, but as you might expect this is the town where you go to get Pie. We rolled in just after midday and after calling at the first cafe, we took the ladys suggestion to head to the Toaster House for a shower first! Words cannot do this place justice, but it’s essentially a house that a family of 6 once lived in, then once they had grown up and moved on, left for hikers and bikers to stay for free. 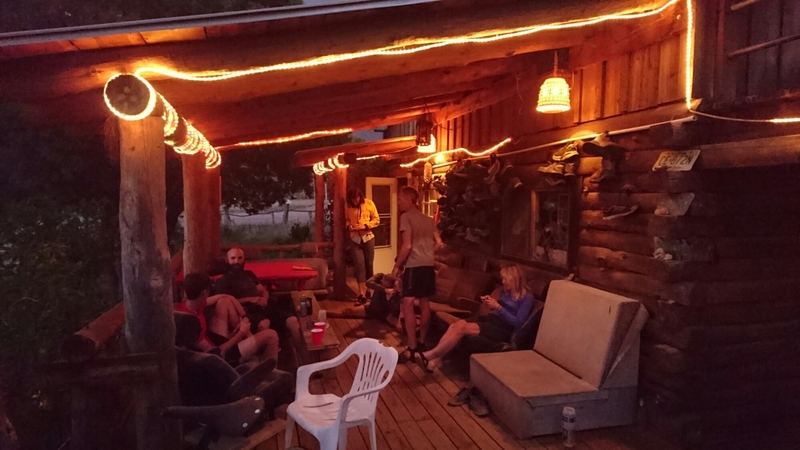 The place has water, electricity, and was stacked full of food left by overloaded hikers, all free to help yourself to – absolutely amazing after days of nothing! We got comfortable then headed back to ‘The Gathering Place’ for a burger, cold coke, and of course, pie! The food was excellent, and we bumped into 2 of the guys from a couple of days back, plus a father and son all doing the same route. Some characters present we spent the evening swapping stories of travelling and couldn’t quite believe what we had come across, if anyone is ever heading through, I can’t recommend the Toaster House highly enough. Did you know there’s a town called Magdalene about 40km east of Pie Town? Would have been worth the detour for a photo……. !